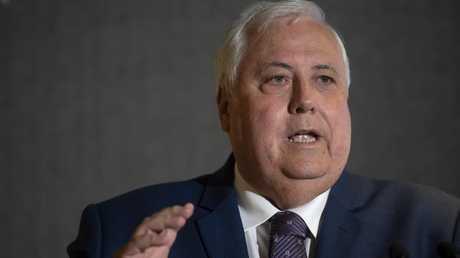 POLITICAL pundits say controversial businessman Clive Palmer has "no hope in hell" of picking up a seat the upcoming federal election. So, what's the point of spending millions of dollars on costly television advertisements, text message spam and a bizarre game? "I don't think he's got a hope in hell," political advertising guru and Labor campaign strategist Dee Madigan told news.com.au. "There's a myth that name recognition will help a candidate get over the line but I can't see how this works for Clive. His name recognition is high but he's disliked." 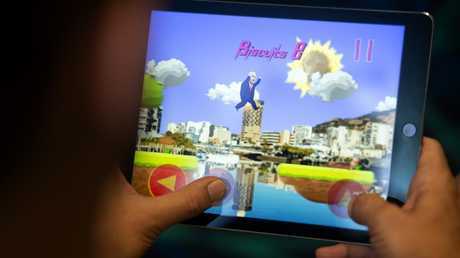 The Campaign Edge creative director described his campaign activities as "so bizarre" and said Mr Palmer was "either entirely delusional or he doesn't care". Election analyst and ABC commentator Antony Green has rated Mr Palmer's political chances in the seat of Herbert as "nil". "Independents and minor parties don't win marginal seats - that's the rough rule," Mr Green told the Sydney Morning Herald. Ms Madigan said his reputation in Herbert, which takes in the regional town of Townsville, was severely damaged by the collapse of Mr Palmer's Queensland Nickel business in 2016. Mr Palmer yesterday rubbished claims from former employees that they are still owed salaries and entitlements and described it as "fake news". 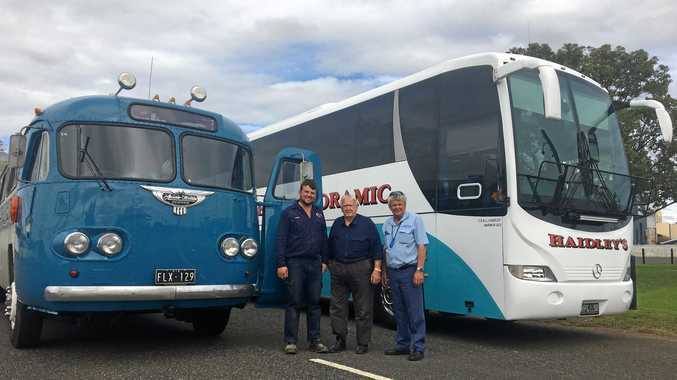 "It's public record that most of the Queensland Nickel workers have been paid everything they're owed," he said. "His quote in the press today, where he said most of his creditors have been paid, is astounding. Most of them? How many?" she said. 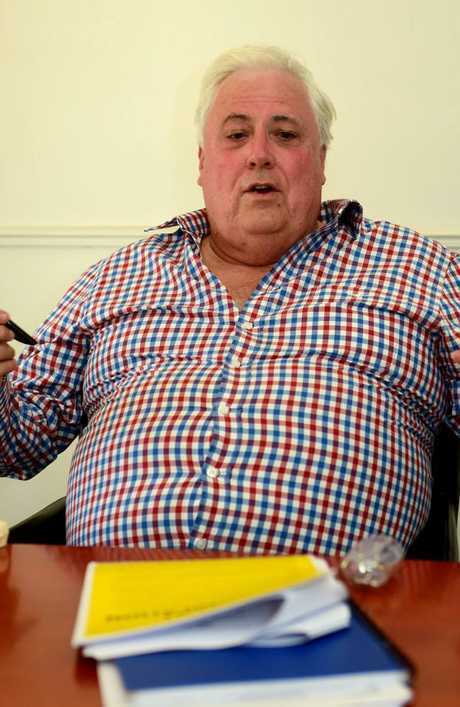 Clive Palmer is spending a fortune on billboards, TV and radio ads, and text messages sent to millions of Aussie mobile phones. Monash University senior politics lecturer Nick Economou said Mr Palmer's political ambition "seems somewhat ludicrous". 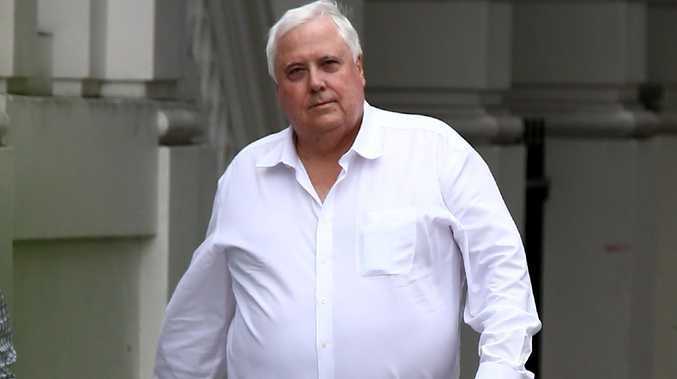 "It would seem Palmer's return to the fray is another manifestation of his narcissistic nature, although there is also a strong hint of opportunism behind the formation of the UAP," Dr Economou said. "In the past two general elections, an array of minor right-wing parties - be they anti-environment, socially conservative or populist - have captured seats in parliament, only to later disintegrate between election cycles. "Presumably, Palmer sees a potential constituency and he is out to win its vote." "I think he's going for the disgruntled vote but there's too much competition. You've got Mark Latham, Pauline Hanson, Bob Katter and Fraser Anning. There's only say 15 per cent of disgruntled voters in the total vote. It's not many," she said. 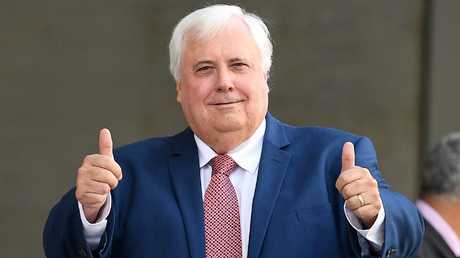 "Palmer's party has flagged its intention to contest every lower house seat, but his candidates will be unlikely to garner 35 per cent of the vote anywhere - the minimum prerequisite for winning a seat," he said. "The UAP's best hope is in the Senate, and especially in Queensland. But here, changes to the Senate voting system will also hurt the party's chances." The party will have to battle a kind of optional preferential voting structure after changes made by Malcolm Turnbull's government two years ago, he pointed out. 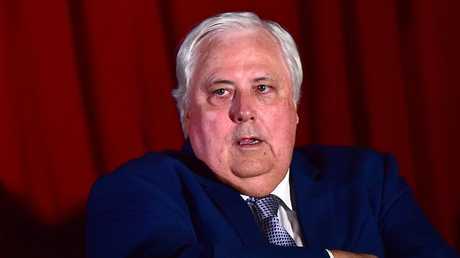 "While he might try to plagiarise the American president, the truth is that Palmer is no Donald Trump," Dr Economou said. "Trump was the official candidate of one of the two major parties that dominate the US political system and won nearly half of the popular vote in the 2016 election." "He's running ads in areas where I don't think he'll field candidates, but even if he did, they wouldn't have a hope in hell of winning," she said. Mr Palmer has been saturating television screens with ads for his party, one of which earned him a threat of legal actions by rock band Twisted Sister, who claim he's using their song without permission. Boy George's manager Paul Kemsley told the ABC the usage was "a clear copyright infringement" and said record label BMG would be taking up the matter. "Boy George's song and art would never be used to endorse any political campaign," Mr Kemsley said. "I'm horrified at the treatment of one of the biggest-selling songs of all time." "We know that text messaging as an election tool can backfire if people feel it's uncalled for or they're not the target market, and that's the case here," Ms Madigan said. Recipients of the texts flooded social media with furious reaction and it's understood the campaign prompted thousands of complaints. Ms Madigan said it appeared the party was organising its efforts "in-house" given the low production quality of the TV ads. "Sometimes it's not a bad thing to not look too schmick, but there's a fine line and I think he's crossed it," she said. "It feels like a used car yard ad. That's not what you want from a politician." An unapologetic Mr Palmer yesterday vowed to continue targeting Australians' mobiles and said the law allowed him to do so. "We'll be running text messages as we get closer to the election because it's a way of stimulating debate in our democracy," he told reporters. 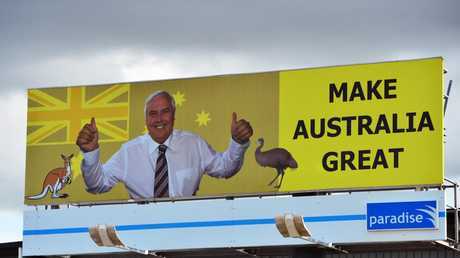 Ads for the UAP have also appeared in print and on radio, with countless billboards also popping up across the country emblazoned with his face and the tagline "Make Australia Great". "We're spending money and we've got a lot of money to spend," he said. "There's no limit to how much we will contribute, I've put no limit on it." Many of the TV ads run by UAP have appeared in high-priced, prime-time slots - including during Sunday night news bulletins on Channel 9. 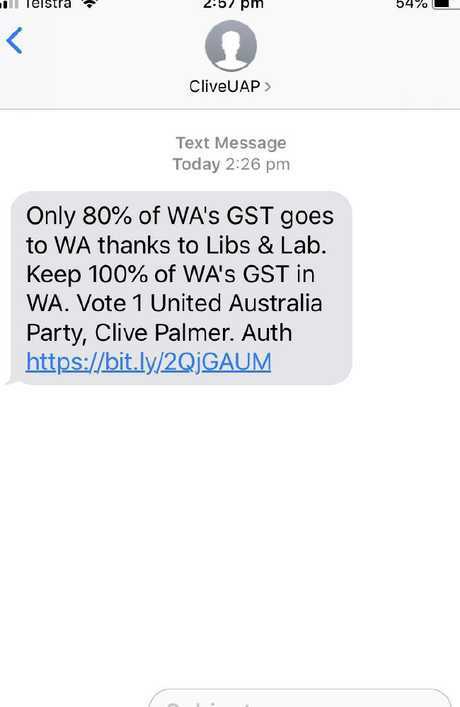 Clive Palmer is bombarding people across Australia with text messages for his United Australia Party.